Perhaps the ‘Just-Right’ size for you is the Mini-4 Bay unit which at 10’ tall, it easily fits on less than a 20’ x 20’ footprint or converts into a single bay unit to stand against a wall with modest 10’ x 15’ required Just pick the SNAG® Inflatable that best fits your needs. 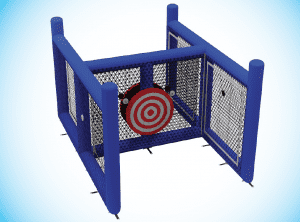 There are multiple ways to recoup your investment into an Inflatable SNAG® Driving Range. In addition to daily rental fees of $1,000 to $2,500 to appear at other peoples or company events, you can also set up your own lesson, range and 6 hole golf course for the public daily fee – a real revenue producer. The first and most overlooked is the SNAG® Sign Sponsorship . . . We have designed FOUR large 5.5’ x 6.5’ sign opportunities on each of the Inflatable Ranges. 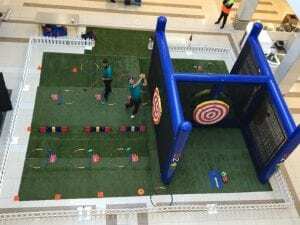 These can be sold on an Annual Contract to appear everywhere the SNAG® Inflatable Driving Range appears in community events. A GREAT sponsorship opportunity for local business . . . Price from $995 to $5,000 each sign depending on if it is a Full time sign or in a rotation with another company at every other event. This package, depending on optional equipment, will ship on 1-2 pallets via ground truck freight.